There is no question that financing investment real estate is harder today than it has been in the past. Lenders are more cautious than ever about vacancy rates, historical financials, tenant turn-over, market conditions, current rental rates as compared with market, tenant financial strength, and Borrower / Guarantor fall-back liquidity, cash-flow and assets. Financing still exists for commercial investment properties, but only for those that are structured properly on the front-end so that they mitigate most of the Banks typical concerns. We have placed many investment properties with lenders, including those with high vacancy, short-term leases, and those in markets that are struggling. The key to our success has been our strong underwriting and work on the front-end in mitigating the concerns the lenders will have. Being former lenders that are experienced in how lenders process these requests, we know what our lenders are looking for and what we need to do to overcome the hurdles that otherwise might doom a loan request. 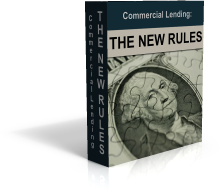 Lending sources available include traditional banks, insurance companies, bonding of leases, private lenders and hard money lenders.